When we think of The Opera Guild of Dayton, we think of excellence extraordinaire in performance and creativity. When we think of one of its fundraisers, BRAVO! 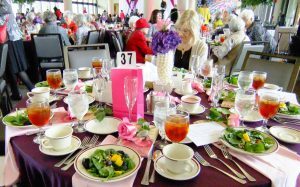 Champagne Brunch and Fashion Show, we think of beauty, grace, charm and fashion supreme. 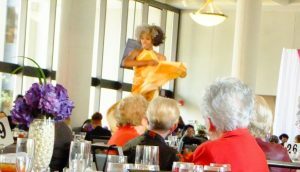 On Friday, September 7, the Opera Guild of Dayton held its annual BRAVO! 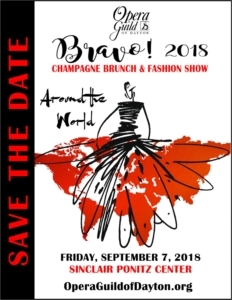 Champagne Brunch and Fashion Show. This year’s theme was “Around the World”. Chair Hyacinth Paul promised the event would be filled with lots of fun, glamorous fashion and delight and she delivered. To view the pictures from BRAVO! please click here. The day began with Boutique Shopping at 9:30 a.m. and the Social Hour at 10. A wonderful seated brunch commenced at 11:30. 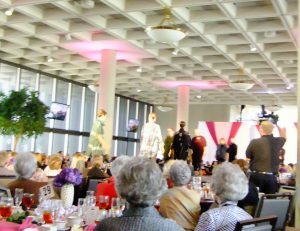 Diverse and exciting models and fashions took to the runway at 12:30 p.m. The mellow voice of Emcee Shawn Yu returned to provide commentary on all the happenings of the show. Fashions were arranged by Hyacinth with many coming from her shop at the Dayton Mall–Simply Hyacinth. She is a personal stylist for an exceptional line of menswear in the show from J. Hilburn. Showing her diverse talents, Hyacinth had designed many leather jackets and accessories some of which were on the runway also. This year the Guild again presented an opportunity to vote for your favorite Community Models. The winner was Dr. Jhansi Koduri MD, followed by runner-ups Dr. Susan Grandhi MD in second place and Linda Menz in third place. What a celebration for the 30th Anniversary of BRAVO! 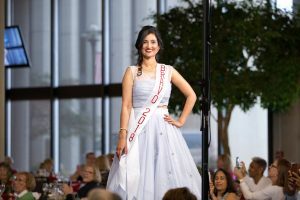 The Opera Guild orchestrated a most exciting event with professional models and the latest styles under the leadership of Chair Barbara Stewart Bostick and her committee. Get Dressed! Boutique on Far Hills Avenue in Oakwood presented the looks, the models and the chic inspiration for this important fundraiser. Why be ordinary when you can be extraordinary? This has been owner-founder Tracey Schumann’s approach to apparel, shoes, jewelry and accessories since she opened Get Dressed! Boutique more than 25 years ago. Offering understated luxury, the boutique is the go-to place for today’s fashion-minded and well-traveled woman. 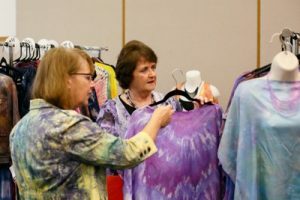 Tracey partnered with producer Jackie Doss to present styles that were truly wearable across many diverse ages and body types. 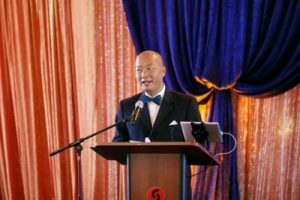 Again this year the Show was hosted by Shaun Yu of WDPR Discover Classical. 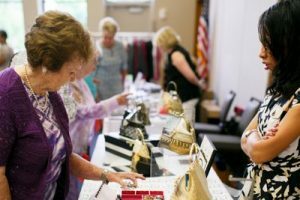 This was the fourth year that the Opera Guild has partnered with outstanding members of the greater Dayton community to highlight Community Models. Their contributions and credentials are impressive and far reaching. The 2017 models were (from left to right): Fran Duntz, Ramon Gaitan, Lisa Hanson, Diane Buchanan Johnson, Stacy Thompson Speare-Hardy and The Reverend Fr. Benjamin E. K. Speare-Hardy. The winner was Diane Buchanan Johnson with 1st runner up Fran Duntz and 2nd runner up Ramon Gaitan. Simply Hyacinth provided fashions for our female Community Models to wear on the runway and Linwood Men’s Specialty Shoppe dressed the men. Vendor Co-Chairs Valerie Jones and Stephanie Norwood lined up an exciting array of participants in the BRAVO! Boutique. Those doors opened at 9:30 a.m. and remained open for one hour after the fashion show. 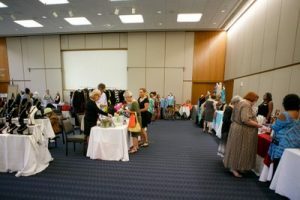 As guests arrived in the upstairs lobby of Ponitz Center, they were greeted by music and song as they check in and wandered into the Boutique. This entertainment was provided by Holland “Captain H” Makupson. He is a romantic balladeer with a voice of experience. He sings Classic American popular songs. As an artist, he was a member of the Dayton Philharmonic Chorus. Makupson acted and sang with Opera Columbus (Porgy and Bess) and Center Stage in Antioch (The Bat). He has also performed at the Miami Valley Country Club, the Dayton Woman’s Club, the Montgomery County Retired Teacher’s Association Luncheon and the Dayton International Airport. 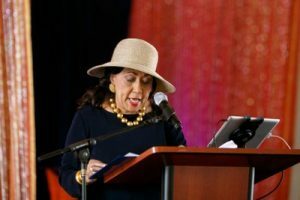 Other performances include the MLK Musical Concert in Victoria Theatre, American Red Cross Society All Day Benefit Concert for the Haitian Relief Fund and the 120th Anniversary of St. Margaret’s Episcopal Church. His creativity in the arts included the music and lyrics for the Dayton Public Schools promotion of Careers, Public Library Cards and Kids Voting. Entertainment during the 2017 BRAVO! Fashion Show itself featured two spectacular performances. Broadway songs were offered by Dr. David Sievers who was accompanied by John Benjamin. Dr. Sievers is a tenor and an Artist-in-Residence at the University of Dayton where he teaches private voice and related coursework. He also is the conductor for the UD Opera Workshop and has served as Director or Music Director for several productions at UD, including Die Fledermaus, Once Upon a Mattress, Gianni Schicchi, The Pirates of Penzance, Smoke on the Mountain, and Urinetown. His roles for the stage have included several of the great character tenor roles in opera and musical theater. He has sung the tenor solos in Beethoven’s 9th Symphony, Mozart’s Requiem, Carmina Burana, The Creation, Rachmaninoff’s Vespers, and Adolphus Hailstork’s cantata I Will Lift Up Mine Eyes. 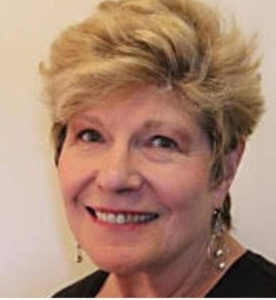 Raised in Kennewick, Washington, Dr. Sievers holds a Bachelor of Music degree from Washington State University, a Master of Music degree from Boise State University, and the Doctor of Music degree from the Indiana University Jacobs School of Music. A church musician since the age of 12, he is also currently the Pastoral Associate of Music and Liturgy at St. Luke Parish in Beavercreek, Ohio. The second performance was a return engagement of Marlayna Locklear. She hails from Milwaukee,Wisconsin. She began her training at the age of 12 at city ballet theatre and went on to graduate from Milwaukee High School of the Arts and University of the Arts In Philadelphia, Pennsylvania with a BFA in Ballet and Jazz. Marlayna was one of the founding members of The Milwaukee Dance Connection and has gone on to dance with Eleone Dance Theatre, Cleo Parker Robinson Dance Ensemble, Dallas Black Dance Theatre II , Dayton Contemporary Dance Company and Deeply Rooted. She is a freelance artist who teaches and choreographs at universities around the nation. Marlayna is also the founder and director of Indurance Dance Intensive. She most recently finished studying abroad in Italy with VIVO Ballet and will head to Bulgaria in the spring to work with South African choreographer Fana Shabalala on the INDUMBA project. There are so many people to thank for their support and hard work. The Guild’s appreciation goes to them all. One special group is our sponsors. They include Bob Ross Auto Group, RTA, Montgomery County Commission, Sinclair Community College, Key Bank and The Dayton Foundation. Another important group that made this spectacular 30th edition of BRAVO! possible was the committee chaired by Barbara Bostick. They consisted of: Dolores Anderson, Sam Bennett, Karen Brown-Fallings, Kathy Brown, Suzanne Crippen, Nancy Farkas, Barbara Haller, Linda Harrison, Kathy Hedges, Ann Herr, Betty Holton, Valerie Jones, Helen Jones-Kelley, Dana Kane, Patricia Langford-Finley, Amy Lombardo, Belinda Mathews-Stenson, Stephanie Norwood, Brenda Philips, Geri Prada, Carol Prewitt, Jane Reynolds, and Penny Wolff. Congratulations and gratitude go to them all. As we look back over this year’s BRAVO! with its color and excitement, we wish to send grateful thanks to our many sponsors. They include: Heidelberg Distributing, Lee Monnin, Montgomery County Commission, Regional Transit Authority, Ross Auto Group, Dr. Thomas Cooke and Sinclair Community College. Further, we sincerely appreciate and thank our Underwriters: David Criner & Diane Morgan of Pillar Advisory Group at Raymond James and Associates, Mike Houser, Kathy Brown, Jane Reynolds, Dana Kane and Lois Sutherland.